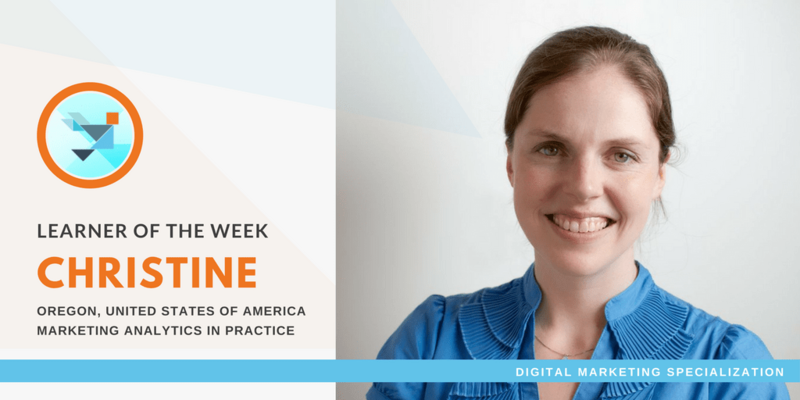 Meet your classmate Christine Bennett, a Director of Digital Marketing and Marketing Analytics in Practice learner in the Digitial Marketing Specialization. I grew up just outside Los Angeles but moved to the San Francisco area for university and the start of my career. I’ve always felt more at home in the outdoors, so for the last few years I’ve divided my time between my agency’s headquarters in San Francisco and Chicago, and my current home in rural Oregon. When we moved out of the city, I jumped on the opportunity to pursue beekeeping! I am a naturalist at heart and have always loved the ecological relationship between ant and bee colonies and their environment. It’s a humbling hobby that’s introduced me to a whole new world of challenges and rewards. I’m the director of digital marketing at HDMZ, a full-service agency based out of Chicago. We are focused on healthcare, medical device, and life science brands dedicated to making the world a better place. Our team of five manages every aspect of our clients’ digital campaigns; any given day, we touch content marketing, programmatic advertising, analytics, tag implementation, platform integration, social media, SEM, SEO, website UX optimization… and everything else in between! Every day is different, and I have the honor and privilege of working with some amazingly smart, humble, and passionate people–both clients and coworkers. We deal with data on a daily basis, and there’s no room for error. I believe it’s irresponsible for marketers to hide behind “spin”; we owe our clients (whether internal or external) the honest, actionable truth. I started this course because I wanted perspective on best practices, insight into making my own data analysis processes better, and a new evolution in pushing myself to work smarter and communicate more effectively. How have you applied what you have learned throughout the Digital Marketing Specialization? HDMZ applies the FiveEyes™ model (Input > Insight > Inspiration > Implementation > Impact) as an iterative and outcomes-based model for every project we execute. This course highlighted a very similar model, called MAP (“Marketing Analytics Process”), which steps through a very similar strategy (Plan > Collect > Analyze > Report). I was struck by the validation and fundamental importance of working within this sort of outcomes-based approach, and especially appreciated Professor Kevin Hartman’s (Head of Analytics at Google) emphasis on the use of just one (yes, just one!) primary objective by which to measure success. Frequently we become wrapped around multiple conversions or goals, and this muddles our ability to be effective. Microconversions have their place, but the primary KPI should remain just that. Digital Marketing is a complex but wonderful landscape and one that you can excel in if you approach data with respect, honesty, and hunger. The more practical application you can make with your skills, the more valuable you will become. Don’t be afraid to get your hands dirty, but always keep the outcome (the story you’re being paid to tell) well in view. Use these courses to find the niche you can excel in!